Do you think turkey hunting is a solitary sport, just you against a wily old tom? 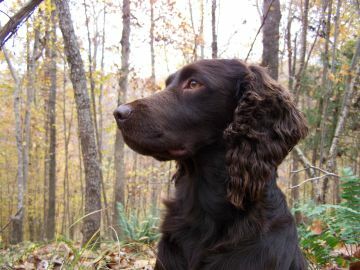 Try going to the woods next fall with your faithful Boykin spaniel in tow. It is rumored that the liver-brown coat that so characterizes the Boykin spaniel was purposefully bred into the dog to provide camouflage while laying in wait with his master in the pursuit of the wild turkey. The incredible prey drive that Boykin breeders have been so careful to maintain lends itself wonderfully in the pursuit of turkey flocks. Famed turkey writer Tom Kelly has said that without a gun it is hard to adequately bust a flock of turkeys. Tom Kelley does not and has not owned a Boykin. With a few handy training tools and plenty of time, a Boykin can become a proficient turkey dog before its second birthday. The biggest obstacle to overcome when training a turkey dog is teaching the dog to lie quietly during the callback of the turkeys. The chasing of deer is the second biggest factor. 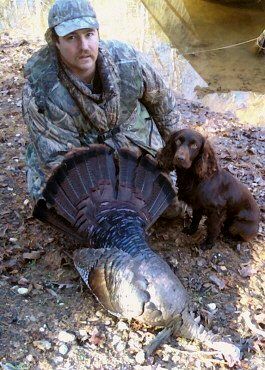 The most effective tool you can possess in the early stages of training your pup to be a turkey dog is a dead turkey. The next most important tool is time. With a tuft of turkey feathers tied to the end of a section of fishing rod, attached by a few feet of fishing line, get pup to chase vigorously, keeping the tuft just out of reach. Let him come close and tempt him to jump up in the air, keeping the game up for ten or so minutes. I let my pups succeed in catching the feathers a few times each session, but prying the feathers away can be tough. Be gentle. Be cautious of where you lead the pup, (you could send him crashing into furniture during the pursuit) and don’t overdo it. Keep him excited and then put the feathers up. Afterwards, get outside and take him for a walk. All this will lead up to the toughest part of training: sitting still. "It only took Buck an instant, after being awakened from his nap by the report of the shotgun, to see the flopping turkey just twenty feet away." Taking your dog for long walks while he is still very young is very important. This introduces him to the great big outdoors and it tires him out. Jumping over, ducking under, and wallowing through rough terrain is hard work for such a small dog. And having a tired dog will greatly assist you in the next lesson: sitting patiently. After a good long walk, spend some time sitting. Have your dog lie on the same side that you shoulder a gun. You don’t want to have to shoot a turkey from your left side as, if you are a right handed shooter, it will mean holding your gun over your dog's head. But let’s not worry about the gun right now. In the summer, after a good hike when you both could use a break in the shade, have your dog lie beside you. Simply pet him and calmly remind him to sit. Young pups will still have plenty of energy and will squirm a bit, so praise him when he’s perfectly still. Don’t expect too much at first but try to give a couple of reminders of the "sit" or "stay" commands as you sit, praising when your pup complies. As time goes on, you will find that your pup will mind you even when an unsuspecting deer or squirrel approaches. An e-collar can make quick work of breaking your Boykin of chasing unwanted game. Make sure that you properly collar condition your pup using the method described in the manual that accompanies your collar. Please don’t slap a collar on your dog and give him a correction without preparing him for it. Improper use of a collar can be the undoing of a good prospect. After the dog is used to training with the e-collar, turn the collar up to its highest setting and test it on yourself. If you think that the stimulation you get is too much for your youngster, then turn the collar down some, but use enough stimulation on your dog to discourage him from chasing any unwanted animals. When your dog is in pursuit of a deer, a rabbit, or anything you don’t want him to chase, do not tell him "no" or call him back to you. Instead, let him enjoy the chase. Then, without warning, press and hold the constant button on your collar. If the collar is turned up high enough your Bpykin will let out a squall and break off the chase. More than likely he will turn and head back to you. If the collar is not turned up high enough, he may continue to chase. In that case you will have to use a higher setting. The reason we crank the collar up so high and don’t try to stop the chase vocally is to get the dog to think that the animal he’s chasing is the cause of his discomfort. He will not associate you with the collar correction, and will come back to you for relief. I was taught this trick by a friend with a pack of rabbit hounds, and though at first I was hesitant to do it to my young Buck, I tried it and have never had him chase a deer since. Now when he sees a deer or is scenting behind one, he turns and checks in with me. Be prepared to do this at all times when you are on walks, but don’t be surprised if you only have to do it once. Expect to use this technique on different animals; I didn’t do it on squirrels and Buck will still chase one if he is close enough to think he can catch it. The actual work of hunting turkeys comes easily if the obedience lessons have been put into place. While walking in the woods, keep an eye out for fresh turkey sign. Fresh scratchings made by turkeys will be devoid of leaves and will show exposed, moist ground unlike the dry, leaf covered appearance of old sign. Likewise, fresh droppings will still seem moist. Your dog will know if the turkeys have passed through recently. Keep an eye on his demeanor; when his tail starts twitching rapidly, you will know he’s on a fresh scent. Some turkey dogs range very close. My Buck stays within easy shotgun range until he hits fresh scent. Then he’s off to the races. If your dog ranges a bit far, don’t fret. After a few exciting flushes, a Boykin will typically give mouth - or bark excitedly - when flushing a flock of turkeys. You will be able to tell where the action is. If you plan on using your Boykin for upland work, you may want to encourage him to stay closer by using your whistle and keeping him looking back for you. Most Boykins will check back on you periodically if you are not keeping up. When the flush is made, you should either hear the excited cackles of frightened turkeys or the bark of your Boykin. Try your best to pinpoint where the commotion came from. Depending on the size of the gang of turkeys, you may want to try to scatter them some more, because it is best to have the birds down to individuals, rather than several small groups. As your dog gets more proficient at the game, he will take off in each direction that he saw turkeys fly, and effectively scatter the whole drove. Now it's time for the actual hunting. Pick out a good sitting place as close to the flush site as possible. With your hot, panting Boykin lying at your side, wait several minutes and get comfortable. Turkeys could take 15 minutes to several hours to calm down enough to want to get back together. Keep a sharp ear out for any turkeys starting to call. Once you’ve gotten comfortable and all debris is cleared from under your rump, give a few yelps. When you hear a turkey respond, try to imitate the sound you hear. Keep a good lookout for approaching birds. And remind your buddy to remain lying still. After the shot, I prefer my dog to break toward the turkey. When I make a good shot, my Boykin will be on him in a flash. If I wasn’t so accurate in my shot placement, my dog will be in hot pursuit of the crippled bird. Should I miss, well, there’s nothing lost, the turkey will outfly both of us. 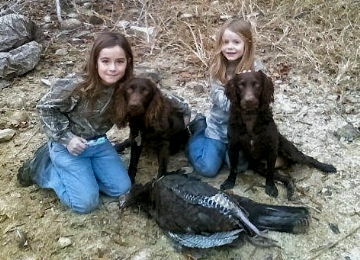 If you have another hunting partner, you may want to collect your bird and Boykin quickly and settle back down. More turkeys could still approach, even after hearing a shot. To give some meat to this instruction, I’d like to tell a story from last fall. I invited Gratten Hepler, a fellow turkey dog enthusiast, down from Virginia to hunt turkeys with me. We stayed in the woods all day, scoring several flushes but not getting a shot at our quarry. With a good night’s rest, we headed out the next morning to an area where we left a scattered flock the previous day. Buck and Gratten’s Brittany, Missy, hit the ground running on fresh turkey scent. In just moments we heard Buck bark and saw a gobbler sail over our heads. We hustled to the spot where the commotion was coming from and gathered in our dogs. Then we settled in on a big oak ridge and began our wait. After about twenty minutes, we began calling. The woods were mostly silent except for our imitations of turkey sounds. Time began to drag by. We knew we had a good scatter, but the sight of the gobbler that sailed over us earlier gave us reason to worry. Gobblers are much more reluctant to get back together than hens and their young of the year. Buck was at my right side, contentedly snoring. This was quite welcome, since on a previous hunt, he finally had enough of sitting still and decided to chase a squirrel that hopped within a few feet of us. As I grew more and more uncomfortable with the wait, I heard a muffled clucking from my left hand side. I looked to my left and caught the movement of an approaching tom turkey, nervously eyeing his surroundings. When I saw him, he was already within easy shotgun range so I eased the gun into place and squeezed the trigger. It only took Buck an instant, after being awakened from his nap by the report of the shotgun, to see the flopping turkey just twenty feet away. Like a bolt, he was on our prize. By the time I reached the downed bird, Missy had joined us with Gratten hurrying behind her. The turkey was a beautiful two-year-old, with a nine-and-a-half-inch beard. Fall turkey hunting is a great sport, full of excitement, exercise and companionship. But first, make sure that turkey hunting in the fall is legal. In South Carolina, where the Boykin breed was originated, there is not a fall turkey season. Some states offer a fall season but do not allow the use of dogs. If it is legal in your location, you’ll have the pleasure of working and watching one of the few American gundog breeds - and watching it working turkeys, a bird that’s also distinctly American - just as the Boykin was bred to do more than a century ago.